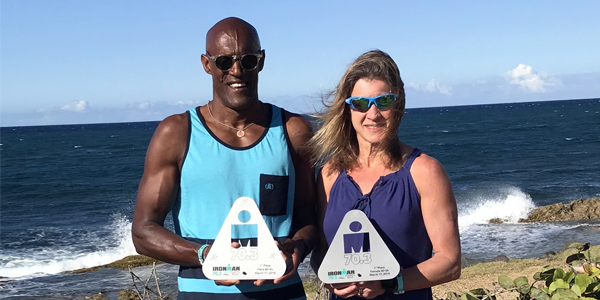 Kent Richardson and Karen Smith both won their Age Group Divisions while competing in the Ironman 70.3 Puerto Rico. Smith clocked an overall time of 4:56:24, winning the Women’s 50-54 Age Group Division, ranking as the sixth female finisher and 78th overall. She recorded a time of 30:48 during the swim and 2:36:22 on the bike course before closing out with a time of 1:42:57 on the run course. Richardson was clocked across the line in a time of 5:14:31 on his way to winning the Men’s 60-64 Age Group Division, ranking as the 117th male competitor to cross the line and 133rd overall. Richardson came out of the water in a time of 34:44 before clocking a time of 2:31:53 on the bike course and finishing with a run time of 2:00:23. Smith and Richardson have now both qualified for the 70.3 World Championship in Nice, France in September.